By the end of Thursday, LA Unified will be letting the state and county governments know that the district may not be able to meet its financial obligations in upcoming years because it faces a cumulative deficit of $1.46 billion through the 2018-2019 school year. 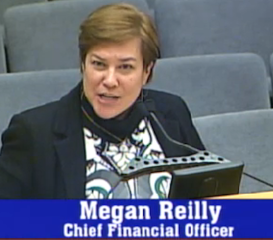 “Qualified means that we may not meet our financial obligations in the subsequent two years,” Reilly said. “That’s what we are suggesting that the board adopt.” The board agreed by consent. Because the district is so large — the biggest in the state and the second-largest in the nation — the budget must be estimated over the next three years, and they must state the solvency of the district. “We start off with a $1.4 billion deficit across three years,” Reilly said when presenting the 2016-2017 First Interim Financial Report. The district is going through a realignment plan with the California Department of Education to offset some of the shortfalls and stave off enrollment losses. But even in the best-case scenario with increases in Local Control Funding Formula and state lottery revenue, they still expect a $252 million deficit by 2018-2019. The predictions are not as severe as the $450 million deficit that was detailed in an independent financial report issued last year, and the district is already working on ways to bring the deficit down even more. Superintendent Michelle King expects to explain what the plan is to make up the deficit when discussing her budget in February, Reilly said. On the positive side, the recent passage of Prop. 55 is expected to add $120 million more to the budget in 2018-2019 if the economy remains the same as it is now, Reilly said. The district must also not see a decrease in the expected $700 million a year they receive from the federal government. What is not included is an additional unfunded liability of $13 billion for health benefits that the district should be saving money toward, noted Reilly. Board member Richard Vladovic pointed out that the board must plan for the worst because it is in “deep trouble” in upcoming years.